Sir James was renowned for his complicated web of holding and operating companies based in Britain, France, other parts of Europe, the Cayman Islands, and Hong Kong. He ensured all his dealings stood up to the most rigorous investigations, and tried hard to convey his concept of a multinational food group with its associated financial companies and a bank providing support, and of Cavenham as a vertically integrated manufacturer, wholesaler and retailer. In the early 1970s, Sir James rearranged all his companies into a single logical structure. A holding company, Societe Generale Occidentale, stood atop an extraordinary pyramid of companies in France, Britain and Holland. Occidentale owned 68 per cent of Cavenham Foods, the main operating company which was quoted on the London stock exchange, 80 per cent of the Banque Occidentale (run by Gilberte Beaux) and 80 per cent of a Holland bank. Cavenham in turn owned 65 per cent of the French dietary and pharmaceutical interests, arranged under the umbrella of Financiere et Industrielle de Petrole et de Pharmacie, and 100 per cent of Procea, Carr & Co, the confectionary interests and the old snuff businesses. In 1972, Cavenham and Generale Occidentale bought a 25 per cent stake in Generale Alimentaire, which was then merged with Cavenham’s French subsidiary to produce a company with a turnover of £100m. Generale Occidentale (GO) remained Sir James’s master holding company. At the centre of his structure was another group, which was to become almost as important as Cavenham, called Anglo-Continental Investment and Finance Company. This small company with profits of less than £25,000 per annum was bought to do business on its own (insurance broking, financial services), and also to be a ‘cash point’ for picking up Cavenham shares in the 1973 market crash Sir James predicted. He liquidated many of his property assets just in time, and this along with Anglo saved him when almost every one of the Slater generation of entrepreneurs disappeared. In 1976, Cavenham went private, buying the outstanding minority of the shares in Generale Alimentaire for £100m. GO now owned 51 per cent of Cavenham, part of it directly and partly through Anglo-Continental. GO also owned 67 percent of Ango-Continental which in turn owned 47 per cent of yet another quoted vehicle, Slater Walker’s property satellite Argyle Securities. GO then mopped up the minorities in Anglo-Continental and Argyle at a cost of £13.4m, and went on to get 100 per cent of Cavenham too, despite protests from the City and the press. At the same time, Sir James announced the final tidy up of Slater Walker, with the banking business folded into the Bank of England. By the late 1970s, the heart of Sir James’s business empire was still in Paris, and he was working on an even more complex reshuffling of companies that would tighten his personal control of Generale Occidentale, while shifting ownership out of France and making the whole operation more tax-efficient. The Financial Times described the fifty pages of restructuring documents as ‘staggeringly complicated’. By 1979, he had also moved his focus on food to solely retail, using the cash from the sale of manufacturing interests to diversify into new US businesses. Sir James then formed Cavenham Forest Industries, a forest and oil company, to look after many of the forestry and timber assets he acquired in the United States, and the Crown Zellerbach and Diamond International properties were melded into one group. By 1987, Sir James owned the major part of four holding companies: Generale Occidentale and Trocadero Participations in France, General Oriental Investments based in Hong Kong but registered in the Cayman Islands, and Diamond International Holdings in the Antilles. All these companies came under the control of his family-owned Bruneria Foundation in Liechtenstein and Lido SA in Panama. 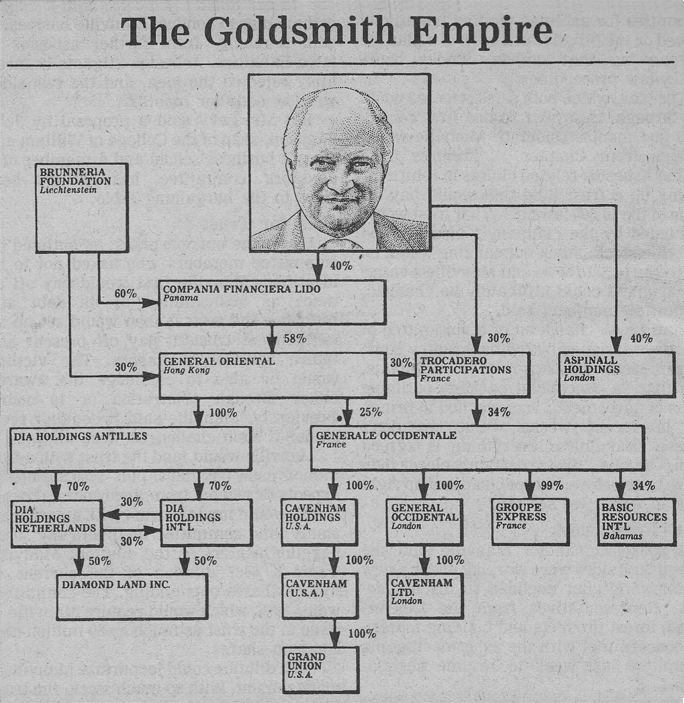 Prior to the 1987 crash, he sold nearly all of the underlying assets and companies, including Generale Occidentale, Grand Union, and the London casino he owned with John Aspinall, enabling him to survive the financial disaster. In 1989, Sir James swapped his 85 per cent stake in Cavenham Forest Industries for 41 per cent of Newmont Mining, previously the largest gold-mining company in the United States, in a deal worth $1.3bn. He sold the final shares for $1.1bn in the 1990s, by which time he was also investing in gold, seeing it as the great contra-cyclical investment and the ultimate hedge against trouble on the currency, political and economic fronts. For the last six years of his life, Sir James became a passive investor, following markets, currencies and commodities with intense interest, trying to predict cycles and trends, and usually betting against the market. His wealth grew by about 50 per cent over that period. Many of these deals were done in the Far East, and it was here he met Tobias Brown who would reinstate General Oriental’s Hong Kong office in 1991. Brown helped Sir James take strategic stakes in emerging companies, and the starting funds of $8m grew to $500m over seven years. Further satellite deals during these final years included American Mobile Satellite Corporation, diversified commodities trader Noble House in Hong Kong, stakes in Russian east coast ports Vladivostok and Vostochny, and investments in nickel operations in Sumatra, Indonesia.